20 A None No Power Seat 20 A is a standard Economy Class seat whose proximity to the lavatories and may be bothersome. 20 B None No Power Seat 20 B is a standard Economy Class seat whose proximity to the lavatories and may be bothersome. 20 C None No Power Seat 20 C is a standard Economy Class seat whose proximity to the lavatories and may be bothersome. 20 D None No Power Seat 20 D is a standard Economy Class seat whose proximity to the lavatories and may be bothersome. 20 E None No Power Seat 20 E is a standard Economy Class seat whose proximity to the lavatories and may be bothersome. 20 F None No Power Seat 20 F is a standard Economy Class seat whose proximity to the lavatories and may be bothersome. 20 G None No Power Seat 20 G is a standard Economy Class seat whose proximity to the lavatories and may be bothersome. 20 H None No Power Seat 20 H is a standard Economy Class seat whose proximity to the lavatories and may be bothersome. 20 K None No Power Seat 20 K is a standard Economy Class seat whose proximity to the lavatories and may be bothersome. 25 A None No Power Seat 25 A is a standard Economy Class exit row seat that has extra legroom, however its proximity to the galley and lavatories may be bothersome. There is no storage for this seat during takeoff and landing. The tray tables are in the armrest, making the armrest immovable and slightly reducing seat width. 25 B None No Power Seat 25 B is a standard Economy Class exit row seat that has extra legroom, however its proximity to the galley and lavatories may be bothersome. There is no storage for this seat during takeoff and landing. The tray tables are in the armrest, making the armrest immovable and slightly reducing seat width. 25 C None No Power Seat 25 C is a standard Economy Class exit row seat that has extra legroom, however its proximity to the galley and lavatories may be bothersome. There is no storage for this seat during takeoff and landing. The tray tables are in the armrest, making the armrest immovable and slightly reducing seat width. 25 G None No Power Seat 25 G is a standard Economy Class exit row seat that has extra legroom, however its proximity to the galley and lavatories may be bothersome. There is no storage for this seat during takeoff and landing. The tray tables are in the armrest, making the armrest immovable and slightly reducing seat width. 25 H None No Power Seat 25 H is a standard Economy Class exit row seat that has extra legroom, however its proximity to the galley and lavatories may be bothersome. There is no storage for this seat during takeoff and landing. The tray tables are in the armrest, making the armrest immovable and slightly reducing seat width. 25 K None No Power Seat 25 K is a standard Economy Class exit row seat that has extra legroom, however its proximity to the galley and lavatories may be bothersome. There is no storage for this seat during takeoff and landing. The tray tables are in the armrest, making the armrest immovable and slightly reducing seat width. 26 F None No Power Seat 26 F is a standard Economy Class seat that may have restricted legroom. The proximity to the galley may be bothersome. 35 G None No Power Seat 35 G is a standard Economy Class seat in the last row of the aircraft that may have limited recline. 35 H None No Power Seat 35 H is a standard Economy Class seat in the last row of the aircraft that may have limited recline. 36 B None No Power Seat 36 B is a standard Economy Class seat in the last row of the aircraft that may have limited recline due to the exit behind. The proximity to the galleys may be bothersome. 36 C None No Power Seat 36 C is a standard Economy Class seat in the last row of the aircraft that may have limited recline due to the exit behind. The proximity to the galleys may be bothersome. 36 D None No Power Seat 36 D is a standard Economy Class seat in the rear if the aircraft whose proximity to the galleys may be bothersome. 36 F None No Power Seat 36 F is a standard Economy Class seat in the rear if the aircraft whose proximity to the galleys may be bothersome. 37 D None No Power Seat 37 D is a standard Economy Class seat in the last row of the aircraft that may have limited recline due to the exit behind. The proximity to the galleys may be bothersome. 37 E None No Power Seat 37 E is a standard Economy Class seat in the last row of the aircraft that may have limited recline due to the exit behind. The proximity to the galleys may be bothersome. 37 F None No Power Seat 37 F is a standard Economy Class seat in the last row of the aircraft that may have limited recline due to the exit behind. The proximity to the galleys may be bothersome. 4 A None No Power Seat 4 A is a standard Business Class seat that has a misaligned window. 4 K None No Power Seat 4 K is a standard Business Class seat that has a misaligned window. 5 A None No Power Seat 5 A is a standard Economy Class seat however, the proximity to the lavatories and galley may be bothersome. There is no floor storage for this seat during takeoff and landing. The tray tables are in the armrest, making the armrest immovable and slightly reducing the seat width. 5 B None No Power Seat 5 B is a standard Economy Class seat however, the proximity to the lavatories and galley may be bothersome. There is no floor storage for this seat during takeoff and landing. 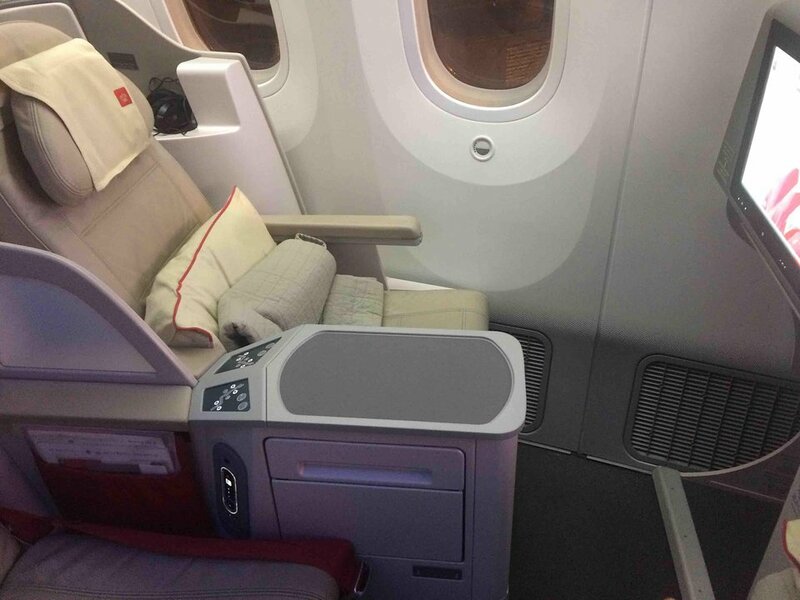 The tray tables are in the armrest, making the armrest immovable and slightly reducing the seat width. 5 C None No Power Seat 5 C is a standard Economy Class seat however, the proximity to the lavatories and galley may be bothersome. There is no floor storage for this seat during takeoff and landing. The tray tables are in the armrest, making the armrest immovable and slightly reducing the seat width. 5 D None No Power Seat 5 D is a standard Economy Class seat however, the proximity to the lavatories and galley may be bothersome. There is no floor storage for this seat during takeoff and landing. The tray tables are in the armrest, making the armrest immovable and slightly reducing the seat width. 5 E None No Power Seat 5 E is a standard Economy Class seat however, the proximity to the lavatories and galley may be bothersome. There is no floor storage for this seat during takeoff and landing. The tray tables are in the armrest, making the armrest immovable and slightly reducing the seat width. 5 F None No Power Seat 5 F is a standard Economy Class seat however, the proximity to the lavatories and galley may be bothersome. There is no floor storage for this seat during takeoff and landing. The tray tables are in the armrest, making the armrest immovable and slightly reducing the seat width. 5 G None No Power Seat 5 G is a standard Economy Class seat however, the proximity to the lavatories and galley may be bothersome. There is no floor storage for this seat during takeoff and landing. The tray tables are in the armrest, making the armrest immovable and slightly reducing the seat width. 5 H None No Power Seat 5 H is a standard Economy Class seat however, the proximity to the lavatories and galley may be bothersome. There is no floor storage for this seat during takeoff and landing. The tray tables are in the armrest, making the armrest immovable and slightly reducing the seat width. 5 K None No Power Seat 5 K is a standard Economy Class seat however, the proximity to the lavatories and galley may be bothersome. There is no floor storage for this seat during takeoff and landing. The tray tables are in the armrest, making the armrest immovable and slightly reducing the seat width. This Boeing 787-8 seats 270 passengers and is primarily used on International routes. 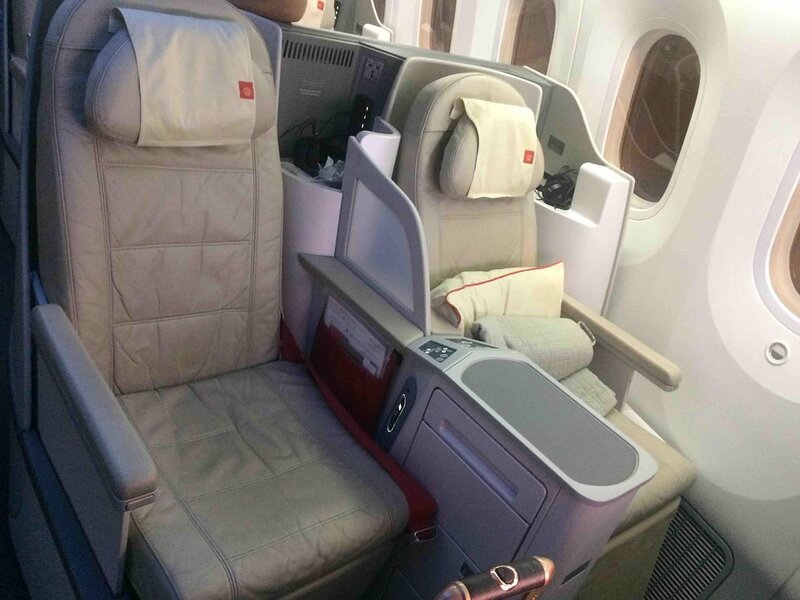 This aircraft features 24 flat bed Crown Class seats and 246 standard Economy seats. 25A and 25K should be red. The exit door protrudes from the wall mere inches in front of the seat, severely restricting legroom. The window is misaligned, restricting shoulder room as well. Extremely uncomfortable, especially for long haul. The first row appears to have a larger space for your feet than the other rows of Business. The seat was very comfortable for sitting and sleeping, and the service was good but not great. The one meal I had was rather bland (an omelette). 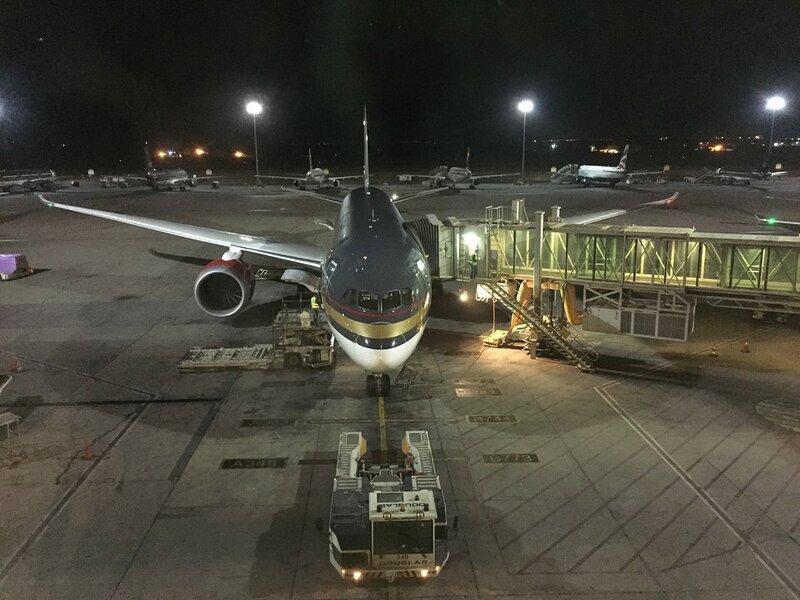 I was scheduled to fly on a Royal Jordanian flight from Amman to Cairo at 115PM. I paid a premium to fly that prime time flight. Two days prior to flying Royal Jordanian cancelled the flight and put me on Flight 505, 5 hours later. They gave no reason and they would not do anything on checkin to make my experience better because of the cancellation--be wary of Jordanian Air if you fly it. 28c was a good economy seat with sufficient legroom and seat width and well away from galleys and bathrooms. Good for a short flight. The flight attendants closed the curtain between the galley and cabin early in the fliht. But for the remainder of the flight they walked through the center of the curtain, letting it drag over their shoulders and fall directly on me in seat 1B. It was impossible to sleep because the curtain was comstantly hitting me. BTW, seat reservations on Royal Jordanian are worthless. We had reserved seats 3D/G months in advance and this was shown on the web site pre-flight. When we arrived at the airport 3 hrs. In advance of our flight, over our protests, we were switched to 1A/B and told they were the only available seats in business class. We have resolved to never again fly Royal Jordanian. Great seat, even though its showing some age (only being in service for less than a year). Great screen size, ample room for storage etc. Only thing is, as others stated- no direct aisle access for those sitting at a window seat (means you have to climb over a stranger when they're sleeping). Beware, the AMM-LHR flight is not always a 787. RJ will change it to a A320 without notice. 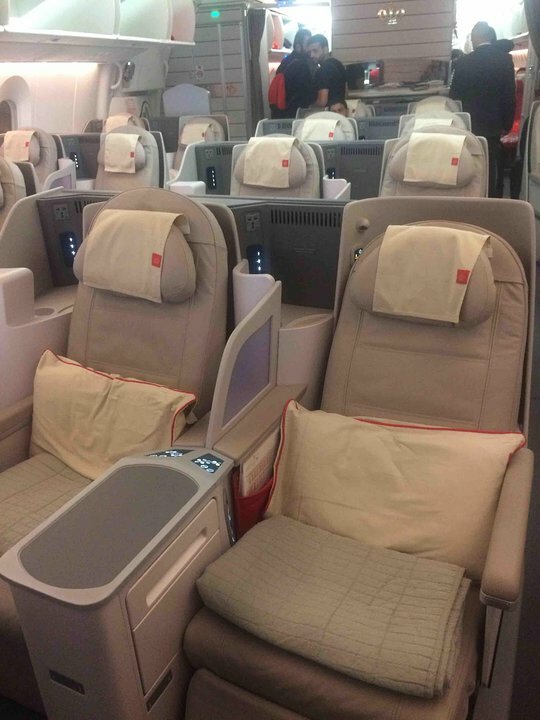 Seats are ok, but especially if you booked business, you will be disappointed. Plane is one of an older series. It was my first flight on the Dreamliner and I did enjoy it quite a bit. The air inflight felt fresher (and more humid), it seems a direct benefit of the no-bleed air on the 787. The seats are roomy and the screens are very big, although the screen resolution is most likely not HD. They are touch sensitive and the system is quite easy to operate. RJ provides a good selection of movies, though it did not correspond to what was described in the inflight magazine. The headphones are noise cancelling and working very efficient to lower the noise. My seat could not be reclined despite various attempts to reset/reboot the seat. It was a 2.5 hour flight only from HKG to BKK, but on a longer flight this would be a BIG bummer in business class. It seems, other seats had the same problem as I could see them F/As manipulating other seats in a similar way than mine. On the return flight all worked properly. Food and service was good, although the meat (pan fried veal) was way overcooked and therefor dry and almost impossible to chew. There is a power plug (a bit cumbersome in the back of the seat) and USB plugs to charge your devices. I appreciated a relaxed yet professional crew that provided a nice service. The overhead bins are quite big and provide enough space. First time on the dreamliner KUL to BKK as codeshare with Malaysia. Extremely comfy business class seat. Very roomy cabin due to the high ceiling at the entrance. 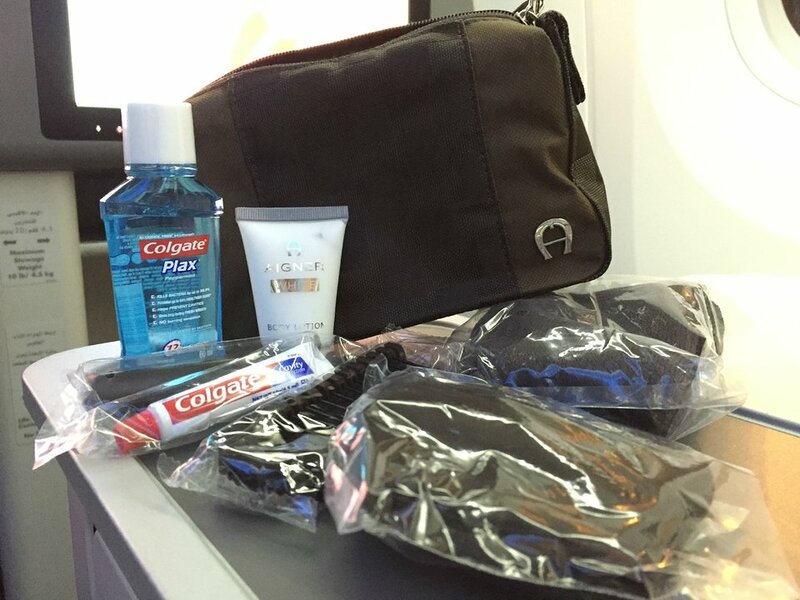 What stands out is the fresh cabin air (is a Dreamliner thing, I understood). Even though it has a classic 2-2-2 layout (so you don't have direct acces to the aisle when having a window seat) I would do it again without hesitation. One thing about 4J, it has only one window which is misaligned so you have to bend forward when looking out. Royal Jordanian flies 1 versions of Boeing 787-8.